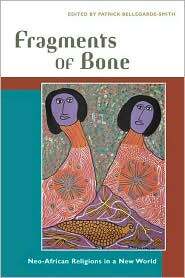 Fragments of Bone is a collection of essays edited by Patrick Bellegarde-Smith exploring the evolution of African religions as they have been brought out of Africa and as they have progressed with humanity through the years. The included essays discuss the many ways in which these religions became forms of defiance, resistance and survival in a world which stripped many men and women of African descent of their cultural identity and heritage, touching upon the variety of ways these religions (wide and varied in and of themselves) are practiced from New Orleans to Brazil and further. Topics discussed range widely, from gender and sexual diversity in these traditions to the role of dance to the role of the sacred twins in mythos and practice, and more. Fragments is packed with an abundance of solid information which comes backed by a healthy stock of notes and references. Each topic is thoroughly discussed and examined with a scholar’s eye, some writers giving us glimpses into the practitioner’s world with quotes or brief references to their own experiences. This work is definitely a scholarly one, however, and reads as such. For my own tastes, most of the essays were bland and dry reads, if not outright stale. Informative, yes — I don’t think anyone could deny that. But for those of us who enjoy a little more spice in our reads, this one wouldn’t be a go-to. By and large it reads as very impersonal, the writing taking on the air of men and women discussing a dance from an arm chair over tea and crumpets rather than going out and dancing till they sweat. For me this is disappointing, especially knowing that some of the authors are practitioners or have at least walked in that setting. While reading through the essays, the moments that stuck out to me as being the richest and most enjoyable were the quotes from people talking about their experiences and relationships to the spirits and their traditions or moments when the authors revealed a little bit about their own experiences. These instances seemed relatively few and far between, however. The scholarly rather than personal nature of this collection would not necessarily be a pitfall for all readers. If scholarly is your flavor, there’s a good chance you’ll eat this up like candy. Nonetheless, I do wish that the passion and the richness of these histories, cultures, and traditions had come across on the pages.